Craniofacial orthopedics is a sub-specialty of orthodontics that focuses on the treatment of patients with birth defects such as cleft lip and palate. An orthodontist will work with a team composed of speech pathologists, oral surgeons, and craniofacial plastic surgeons in planning treatment to correct cleft lip and palate, as well as other jaw and face abnormalities. As a member of a craniofacial team, a craniofacial orthodontist evaluates tooth and jaw development and growth. He or she takes care of the non-surgical treatment of the position of the jaws, and is also responsible for the pre- and post-operative treatment of jaw surgery: monitoring growth by means of X-rays and models. Cleft lip and cleft palate are facial malformations in which the parts of the face that form the upper lip and mouth remain split, instead of sealing together prior to birth. Similar splits can occur in the roof of the mouth, or palate. Clefting results when there is not enough tissue in the mouth or lip area, and the tissue that is available does not join together properly. Though the defect occurs in early fetal development, in most cases, the cause is unknown. However, there appears to be a link with genetics and maternal environmental exposures during pregnancy. Nasoalveolar Molding is a pre-surgical method of reshaping the gums, lips, and nose before cleft lip and palate surgery, to lessen the severity of the cleft. NAM begins at age two weeks and takes three to four months. NAM is used mainly for children with large clefts and has revolutionized cleft repair and reduces the number of surgeries a child must endure. There are certainly aesthetic considerations associated with cleft lip and palate, but having this birth defect can affect people in many more serious ways. Difficulty eating: When there is a separation or opening in the palate, food and liquids can pass from the mouth back through the nose. While waiting for surgery, patients can use specially designed prosthetics to keep fluids flowing downward toward the stomach, and ensure they receive adequate nutrition. Speech difficulties: Because the upper lip and palate are not properly formed, it may be difficult for children to speak clearly. When they do, it may produce a nasal sound. Since their speech may be hard to understand, a speech pathologist may be used to resolve these issues. Ear infections: Cleft lip and palate can lead to a buildup of fluid in the middle ear, leaving children at a higher risk for ear infections, and if not properly treated, even deafness. To prevent infections, small tubes may be placed in the eardrums to facilitate fluid drainage. 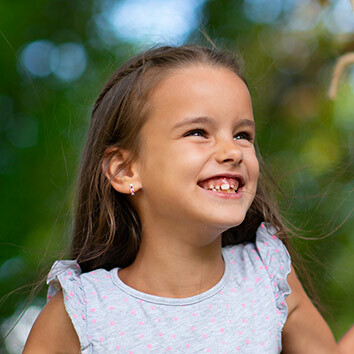 Dental problems: Children who suffer from cleft lip and palate also often have missing, malformed, or displaced teeth, which can lead to a higher number of cavities and other dental and orthodontic issues. Surgery is the treatment for cleft lip and palate. This is where your craniofacial orthodontist and team of specialists come in. Depending on the severity of the case, more than one surgery may be necessary. In children, surgery usually takes place between three and six months of age. Orthodontics for cleft lip and palate children consists of NAM at age two weeks, Early Treatment about age 8, and Comprehensive treatment about age 12. Prosthetics: Permanent crowns, bridges, and implants must wait until growth is compete at age 16-18.